An outstanding hockey player, Howard William “Howie” Morenz (1902-37) was born in Mitchell. He began his career with the Mitchell Juveniles, 1917-18, and after his family moved to Stratford, he played with several teams there, including the Stratford Streak. 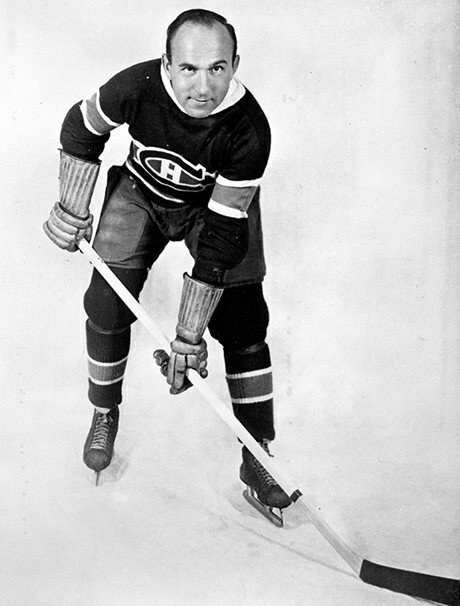 His skilful play, characterized by exceptionally fast skating and intense concentration, brought the Stratford Streak offers from several professional teams and, in 1923, Morenz joined the Montreal Canadiens . His success was immediate and he remained in the National Hockey League (NHL) for 14 years, 12 with Montreal alone. So great were his popularity and appeal that he personally contributed to the NHL’s success. He died of complications from a broken leg suffered during a game. In 1950, Morenz was voted the most outstanding hockey player of the first half of the 20th century by The Canadian Press. Visit the Ontario Heritage Trust provincial plaque in the Howie Morenz Memorial Garden at the corner of Blanchard Street and Huron Road in Mitchell, Ontario. See artifacts at the Hockey Hall of Fame website. Watch Historica Canada’s Heritage Minutes video on Morenz. Listen to Canada’s History podcast where Ryan Kessler speaks with Dean Robinson, author of Howie Morenz: Hockey’s First Superstar.